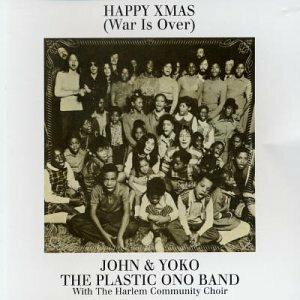 Sometime in New York City, 1971, John Lennon and Yoko Ono came up with a Christmas song for the ages, its subject peace on earth during wartime, its melody extraordinarily similar to “Stewball,” a hoary folk song about a racehorse. Behind its veil of bluegrass, “Stewball” has deep roots plus class and race resonances (if you’ve got the time to delve into these matters, there’s more where this came from, including clips and further linkage), but only a tangential connection to the “Happy Xmas” song. Spector’s influence is clearly a presence on the track—you can hear his signature claustrophobic effects, similar to those on the Paris Sisters’ “I Love How You Love Me” and the Teddy Bears’ “To Know Him Is to Love Him.” But there is another ghost of rock and roll past in the room: The song borrows the feeling and the melody of “Pledging My Love” by Johnny Ace, a well- known Lennon favorite. As most readers know, Spector is currently serving time in a California state prison for using a firearm to murder Lana Clarkson. Legend has it Johnny Ace shot himself by accident, and the persecution of peacenik Lennon as well as his end have been well-documented. Ono continues to work for peace and against gun violence. The song “Happy Xmas (War Is Over)” itself has inspired many covers, none of them worth mentioning, and at least one (Billy Bob Thornton) worth calling out as being unmentionable. The only version worth a bleep I’ve ever heard is the original: It just might be the best rock’n’roll song to capture the spirit of Christmas. Though if, by now you are seeking something a bit cheerier to spin, I wouldn’t blame you, so I’ve included a clip of “Run Rudolph Run” by Chuck Berry—original rock’n’roller and another Lennon-inspirer. Merry Christmas Everybody, and God Bless Us, Everyone. (UPDATE, December 19: I have since seen the film in its entirety and the “Green Green Rocky Road” scene is the best part. Though Len Chandler and the histories of some of the other folksingers of color on the scene—Odetta, Richie Havens, Buffy Sainte-Marie—have been well-documented, the filmmakers chose to render invisible their counterparts or composites in their deeply cynical look at Greenwich Village folk). Inside Llewyn Davis, the new Coen Brothers film concerning a fictional folksinger from the early ‘60s Greenwich Village scene (based loosely in post-modern style on some incidents from the life of actual folksinger Dave Van Ronk and other figures of the Village scene) opened in select theaters this weekend. I have not yet seen the film, but gathered from the soundtrack the title character played by Oscar Isaac, performs “Green, Green Rocky Road,” which Van Ronk himself went as far as to call his “theme song.” With melodic and rhythm roots in the Georgia Sea Islands and before that, West Africa, readers of Keep on Pushing will remember the songwriting credit for “Green, Green Rocky Road” belongs to Len Chandler and Robert Kaufman (yes, as in Beat poet, Bob Kaufman). I had the great and rare honor to interview songwriter and activist Chandler in 2007; large portions of our interview appeared throughout Keep on Pushing and on this site. Chandler spoke highly of Kaufman, Van Ronk, and of course Bob Dylan, who detailed their shared history and collaborations in his book, Chronicles. And yet, it is “Green, Green Rocky Road,” a song Chandler never recorded, that may be one of his most enduring achievements, despite the fact he was a singing hero of the Civil Rights Movement (his contributions to African American/US political and social history remain obscured and inexplicably, largely unsung). Here’s a clip of Van Ronk performing the song, followed by a clip of Chandler performing his own “Keep on Keepin’ On,” from his rare Columbia album, To Be A Man.